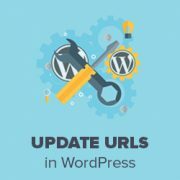 Do you want to update URLs after moving your WordPress site? It can be quite painful to manually edit each post or page just to replace old URLs. 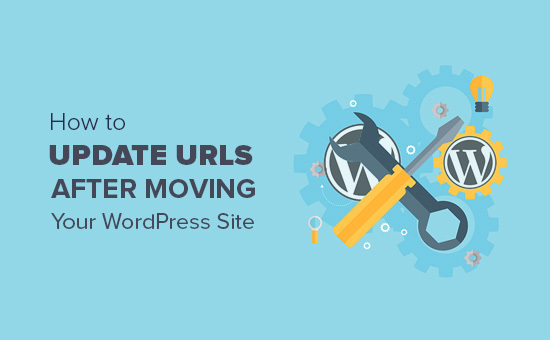 In this article, we will show you how to easily update URLs when moving your WordPress site. When and Why Do You Need to Update URLs? Let’s suppose you moved a WordPress site to a new domain name. You can then change the WordPress address and site URL by visiting WordPress settings page. However, this does not change the URLs that you have previously added in your posts and pages. It also does not change the URLs of images you have added to your WordPress site. Changing all these URLs manually can be very time consuming, and there will always be a chance that you will miss some URLs. That’s where you’ll need this tutorial. Let’s see how to quickly and easily update URLs when moving your WordPress site. First make sure that you have a complete backup of your WordPress site. This will allow you to easily revert back in case something goes wrong during the update process. Next, you need to install and activate the Velvet Blues Update URLs plugin. For more details, see our step by step guide on how to install a WordPress plugin. Upon activation, you need to visit Tools » Update URLs page to configure plugin settings. Here you need to provide the old and new URLs of your website. After that you need to choose where you want the URLs to be updated. You can update urls in posts and pages, excerpts, image attachments, custom fields, etc. Go ahead and select each item that you want to update and then click on the ‘Update URLs Now’ button. The plugin will find and replace all instances of old URL with your new URL. You can now visit your website to see that all URLs are updated. 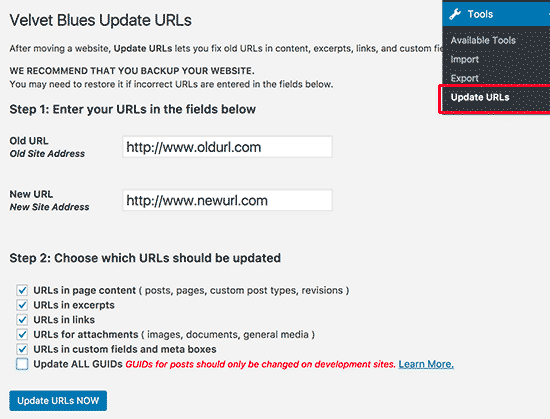 We hope this article helped you learn how to update URLs when moving your WordPress site. You may also want to see our step by step WordPress SEO guide for beginners. Hey will it change all my Quicklinks in each page go my footer. I have different Quicklinks and buttons to the specific pages and all the links needs to be changed. SO will it work ??? Depending on how the quick links were created it likely will not update those but it will be able to update the folder. This article is a blessing !! The same issue happened on one of my client website after migration. when i am trying to add a new image in the slider it is not with updating the new urls & showing 404 errors. After using the plugin Velvet Blues Update URLs the issue is resolved. Thanks for sharing the article. Whats happened is I initially changed my site URL. Now whats happened is that whenever someone clicks on my blog name (when they see my comments on another post) they get a broken link to the old URL. If anyone knows how to fix this that would be great. Velvet blues worked great for regular images in posts but not featured images. Do you know about a plugin that supports changing featured images URLs? I’m storing images in a different server in the new version of my site. It should also update featured images, you may want to reach out to the plugin’s support if it is not updating properly. Does not work for me. However, I may be trying to do something this plugin does not support – moving from non-www to www subdomain. It does support that, if your URLs have www, then you can use the plugin to replace them with non-www URLs. i want to upload my local wordpress site to online, but when i download all the files and want to change the links (localhost/websitename/ ) there is no such links available except two links. As there must be many lins to be changes bu i dont see . Why the links are missing ? The Velvet Blues Update URLs plugin is excellent. I want to share my experience with it. After i did my URL change with it. I still see the error on opening all post. I solved it by going to “Settings > Permalinks” section and then saved my permalinks once more by clicking the “Save Changes” button. This solved my problem and will also solve yours if you still get some error. I am using the same domain but i have changed my hosting. After that my all images in post are not showing. How can i fix this problem. WIll it still maintain it after updating the urls and i delete the plugin? Yes, after you have updated URLs you can delete the plugin. Velvet blues is great, but misses one thing. Does not change URL’s in options if URL’s are there. Say for Custom CSS. Also, anyone have issues of you changing the URL’s, see changes in the DB. But when you go edit the page, they are still say http, when they should be https? Seems to only happen with image URL’s. I used this wonderful plugin in the past, always worked fine. But this time it only changed the full URL links, not the internal links that don’t include the full URL. Any ideas on how to fix this? I had the same issue I just changed my permalink settings to “plain” and changed back to the permalink setting I was using and somehow it works. The plugin hasn’t been supported in over 1 year and is untested with WP version 4.9.1. Nevertheless, I gave it a try, but unsurprisingly, it didn’t work, giving a MySQL server error. So much for a once very good plugin that the developer decides to abandon! We just tested the plugin and it worked as expected. Please try again and see if the error has resolved or may be the error is unrelated to the plugin. Is there anyway I can avoid links from social media breaking once I have done a re-direct? I changed my server keeping same web URL. and properly configured. But why my all old post r showing in google search with page not found. I use Velvet Blues with very good results. However, it is important to note that VB will not change URL in widgets or if there are URLs in your CSS code. These will need to be manually changed. In response to ADITYA’s comment about this being a substitute for 301 redirects. I would say that a find and replace plugin is NOT a substitute for 301 redirects. 301 redirects are still valuable from an SEO standpoint, as well as for users who may have bookmarked or are accustomed to using your old domain. Just using this plugin would result in your users hitting an old site that is no longer being maintained or a site that’s been taken offline. On a personal note, I definitely recommend Migrate DB Pro for this type of activity. It’s worth the money, if you’re doing local development. Does this plug in also work for updating links that are embedded inside tables that I created with TablePress? I also have a number of URLs as part of image descriptions for photos that I added using FooGallery, and i assume that these are stored inside the database, rather than in the HTML for the pages – is Velvet Blues able to update these as well, or do I need a different plug in for that task? My site (which I am going to move from its current directory to a subdirectory of my site that I want to use for an add-on domain) contains about 13.500 images and 500 tables, and it would be extremely tedious to check every single one for links, and then manually replace them with the new URL. I have the same problem changing domain name. Had you learn any tip ? Does anyone know how to get the url’s updated that are in table press?? Cool plugin and great tutorial, I’ve just migrate my domain and I have 300 post. I searched exactly the plugin u reviewed. Thanks for your help. I didn’t needed to replace my internal link one by one. I tried adjusting the permalinks but its not working…yet. Any ideas? Thanks for the wonderful tut , i usually go for backupbuddy for my migration but sometimes due to server limitations backupbuddy doesnt work . This trick comes handy everytime i manually migrate wordpress and works like a charm . My old and new site urls are the same since I migrated my site content from wordpress.com to wordpress.org. Not sure how to use this and get those errors fixed…Please advice! Thanks! I used this plugin after migrating from Blogger to WordPress. None of my image URLs are updating…so none of my images are currently showing on my blog (www.fitchocoholic.com). Can anyone help me with this? I’m freaking out! I installed this plugin and is working perfectly. But my question is, why doest it work on the content build using Content Builder plugins like Visual composer or Muffin tool. i have certain hard-coded links it does change those link. The reason this plugin doesn’t work for content inside Visual Composer is because Visual Composer stores the links in a strange way. If you click on “Classic Mode” in Visual Composer you’ll see that links don’t look like proper URLs. So this will be why Velvet Blues doesn’t change these links. To fix the content, without having to manually edit every link, you’ll need to run another search and replace plugin and search for the urls using this structure. Good tip, ive been trying to work this out for a while now, didn’t even occur to me that the url would have been done like that. Hooray. I am desperately looking to get advice on the following. I have recently flicked my website from http to https. It all works fine however the links in the content hasn’t changed to https. I was just wondering do I have to rewrite them all manually (hope I don’t) or is there any solutions for making them sitewide https? Please take a look at our guide on how to add SSL and HTTPS in WordPress. You will find instructions on how to properly setup SSL and how to handle URLs. **SOS** I have recently changed my wordpress.com site to a wordpress.org site, I followed every instruction on your post about “How to Change Your WordPress.com to WordPress.org” (https://www.wpbeginner.com/wp-tutorials/how-to-properly-move-your-blog-from-wordpress-com-to-wordpress-org/). Everything seemed to transfer smoothly. However, I also ran the Velvet Blues plug-in and it did not work because I needed to update the domain name. I don’t know what to do to fix this, and I am still new at this enough that I don’t trust my abilities to manually adjust the links myself. I’ve already paid and set up/activated everything through Bluehost, and I noticed on the link above that you guys also will change everything over for an individual for free. Is it to late for you to help with that? I desperately need the help and I don’t want to do anything else to “mess up” my new blog further. Have you been able to solve your wordpress migration challenge? detail is holding me back? Whoa, I wish I used this instead of the Broken Links Checker plugin. I have just used velvet blues update urls to change my urls to make them protocol relative, changin http://mydomain.com by //mydomain.com. In order to revert the changes, should I use http://mydomain.com in both the old and new url fields or should I enter //mydomain.com in the old url field and http://mydomain.com in the new url field? Thank your. Love your site! Does changing the links have to be associated with a site move? I.e., I work in an area where tons of wordpress content addresses an internal URL that will be changing, and we’re looking for a way to do it en masse… would this be applicable? Can it ignore parameters in a URL? Great plugin. Worked a treat and saved me hours of time! We ran Velvet Blues today to try to fix the image urls that appear with the temp url address in the html on each page ( but correctly as the file url in our WP Media – eh?) – it hasn’t changed them – we now have the blues? Why didn’t it work? (we moved our site to WP about 3 weeks ago.. stressed! Hi Johanna, have you found a way to solve this? I am about to move my blog from temp to live and I am really afraid of the same thing …. Unfortunately I am still confused about whether “updating the URLs” using these special plugins is actually necessary for when you’re simply taking a development site (in a subdirectory, say http://www.example.com/wpdev) live on the root domain, and not actually moving any files?? For example, I did a test and made my http://www.example.com/wpdev site live by following the instructions is the WordPress Codex. I simply changed the wp site URL in general settings, put a copy of the index and htaccess file in the above root folder (and tweaked index.php to require the subdirectory), updated permalinks and viola: everything works including my links to my attachments in posts. I actually think this topic is one of the more unclear parts of the WordPress Codex. Perhaps I don’t understand the difference in effects between hardcoded links and non-hardcoded links properly? I have been blogging for a while using domain name A. I am changing to a new domain name, domain B. But I have the same hosting account with the same host. I want all my old posts to stay right where they are. I just want my new domain name to lead to them. Essentially, someone who logged in to domain A yesterday would be able to click domain B today and get to the same experience. Will this plug in accomplish that? Thank you for your help! On your hosting account edit your Domain A and point it to some other directory. After that Edit domain B and point it to the directory that was previously used by domain A. You can also ask your webhost for support. After that you will need this plugin to update your URLs, you will also need to update your WordPress site and home URL in wp-config.php file to make sure it is pointing to domain B. Is there a way to do this with WordPress.com? I need a little help. I activated the Velvet Blues plug-in, and had it update my URLS for my old site site.olddomain.com to move to newdomain.com, but now when I do a Google search and click on old links at the site.olddomain.com I get “Not found, error 404″ on the newsite.com. How can I fix this? Also, I’m pretty new to this tech stuff, how do I “manually change any links that are hardcoded”? What’s a hardcoded link? The plugin updates your URLs in the database but you still need to import your old site first and set the permalink structures. Forgive my ignorance. I’m fairly new to all this and I may not be using the right terminology but I migrated from .com to .org last week. I didn’t see the “move your blog” tutorial from wpbeginner until after and so I followed my new hosts tutorial which was MUCH more difficult and technical. Anyway… I’m moved. Everything appears to be working fine but my images are still pointing to the old site. From what i read, this plug in would help but I’m stuck on old url/new url. Isn’t my url the same as my domain name? And my domain name stayed the same when I moved so… I’m a little lost there. On my NEW admin page I can go to settings>general and see that my “wordpress address” and “site address” are both the same as http:// mydomainname which is what I’ve always thought of as my url, both before and after I moved. On my OLD admin page (.com) I can’t see my “wordpress address under general settings. How do I differentiate? We are sorry, but we can not understand how can your old site and new site have the same domain and how can they both be live at the same time? Can you please reply to this comment with your old and new site URLs? I’m betting that he paid wordpress.com to do 301 a redirect from mysite.wordpress.com to his full domain name mysite.com? Doing it via database is painful. Love this whole post and discussion. Some great ideas. Personally, I don’t think this is worth a plugin. I always use an SQL query or export my DB and use text editor to find and replace, then re-import. Works great. Obviously, hard-coded links have to be done manually. I just don’t love the idea of using more plugins unless I have too. Chuck, I’ll try out your SQL next time. Thanks for the tip! I totally agree with you, but in some case, settings are stored as serialized array, and it’s more convenient to use a plugin. Why add more work for yourself, when a plugin can do it just fine. This is not a plugin that you keep active on your site. You install it, use it, and then delete it. What about if you’re moving a site from a sub-directory to root or even the other way around? Can this plugin handle that as well? Yes. Because all it is doing is a search and replace in your database. This is very handy for those who don’t want to go in their phpMyAdmin. Plugins like Duplicator are more useful because they do the whole migration process and then this. You will still have to manually update the siteurl option in order to access the Administration Panel, but then, it will update all your stuff : posts (including pages and custom post types), excerpts, medias, custom fields, options, GUIDs. I’m new to WordPress.org and would please like an idiot’s guide to installing this plugin. I host with GoDaddy. I just moved over and none of my links work. Please help! This is something I didn’t know…used to do this manually …good tip.